The photographs submitted by me appear as a matter of neutral record only. I have no connection with any of the parties involved in the sale. I cannot enter into correspondence. 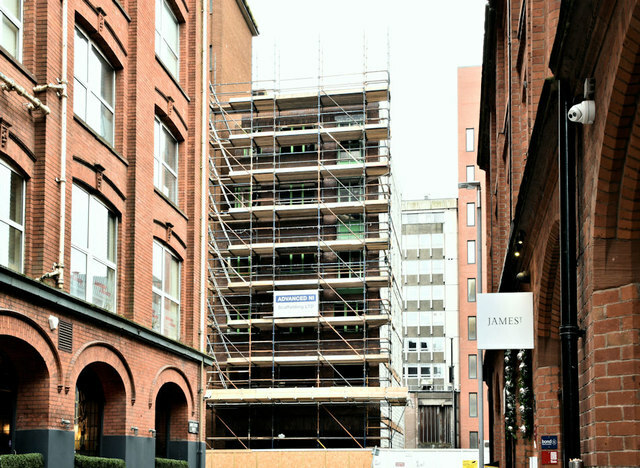 A visitor to the site has supplied some interesting information about former buildings in Donegall Square South (originally built by Adam McClean J3373 : Donegall Square South (part), Belfast (1981) ) – “ I have a property map showing the row of terraces in Donegall Square South. It depicts No 5 as having almost twice the street frontage of the other eight houses. It seems odd to make one larger than the others. The map showed that Adam McClean owned the vacant ground (then known as McClean's Fields) from Alfred across to Brunswick St, and from Donegall Square South to the Blackstaff river as far as the old Dublin road. As the area was developed, the name of the purchaser of each block has been written on the lot. This seems to happen until about 1862, with the Ulster Hall being the last entry”. Charlie Brett described Adam McClean as one of four sons of an innkeeper at Shane’s Castle. That should have been six sons.